How Do I Onboard My Volunteers? 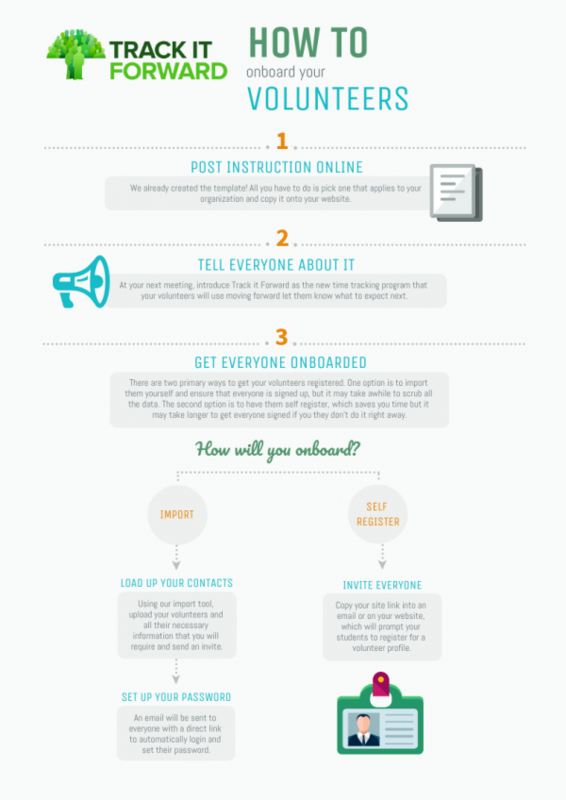 Onboarding volunteers is easy! Don’t worry about scheduling long classes or webinars to get your volunteers onboarded and tracking time. Here are the basic steps you need to follow to get them started. We created a template site that you can copy onto your website with basic instructions for your volunteers. You can either copy it exactly, use it for ideas, or you can create your own instructions! We recommend that your instructions include the basics, such as signing up (if self-registering) or changing password (if imported), how to log hours, how to sign up for events, how to get the mobile app, and then something about who to contact from your organization with questions. It's always best to introduce a new system face to face in front of your group of volunteers to give people the opportunity to ask questions, that they normally wouldn't email you about. Just simply let them know about the new time tracking program that will be rolled out, how it works, and what to expect. There are two main ways to get your volunteers onboarded, you can import or self-register. Here's the difference: If your volunteers self-register, it may save you time, but it may take longer for them to get signed up if they don't do it right away. If you import everyone, you'll know that every volunteer is in the system, but the downside is that scrubbing that date and loading it may take a little longer initially. Whichever you decide, make sure that you provide them our onboarding handout to make it SUPER SIMPLE!